Future so bright, you gotta wear shades? Custo Barcelona's Spring 2017 collection was one of the most optimistic runways of the season. 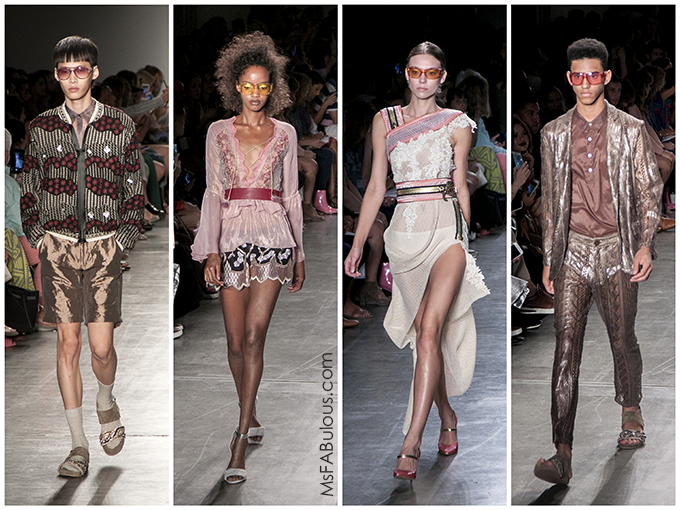 Models wore tinted sunglasses in shades of rose and sunrise yellow. 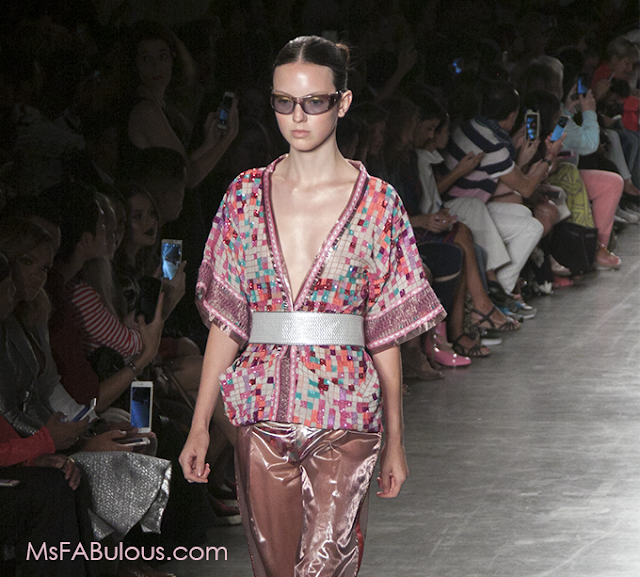 I love looking at individual garments of Custo Barcelona. Each piece is a collage of colors and embellishment techniques combined into one. Metallic sheer jackets could be re-embroidered with sequins and wood. A skirt in crochet could be layered beads, jewels, and tweed. As much as it may look like a jumble, it always works. The color palettes have a 1970s vibe of earthy shades mixed with shine and pastels. The key accessories were the tinted sunglasses as mentioned earlier. Handbags were prominent. They were also given the collage effect of contrasted decoration. Your bag wasn't meant to be matched exactly to your outfit, but complement it in tone and texture. Wide band sandals were the footwear of choice for both men and women. I appreciate that the flashy aesthetic of Custo Barcelona's Spring 2017 collection is balanced for both genders. I know my male friends who are fashion fans are often disappointed with brands that are afraid to carry through their high fashion concepts for the gents. So often, menswear can look the same from label to label. If a designer is going to go for it, go all the way!